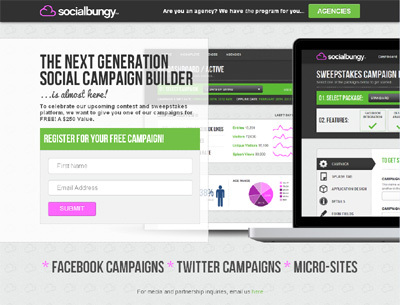 SocialBungy Is The Next Generation Platform For Creating Social Contests and Sweepstakes on Facebook, Twitter, and Micro-Sites. Our DIY platform allows small businesses and large brands to create professional social campaigns without using a “cookie-cutter” format offered by our competitors eliminating the need of a programmer. We offer the most robust DIY campaign builder on the market.